MOTHER BESSIE L. ANDREWS ROBINSON (affectionately known as Mom, Grandma-ma, MaBess, and Mother) was the second of three children. She was born May 12, 1921 to the late Willie and Vester Andrews in Marion, LA. Living a full Christian life, Mother was born and raised in the Church of God in Christ. She was saved and baptized at the age of ten, under the late Elder Andrew Tate of New Edinburg, AR. When her family later moved to Warren, AR, she worked with the Sunshine Band under the leadership of the late Bishop W.W. Washington. In 1948, Mother moved to Buffalo, NY with her son, Burl Smith. While working at Your Host Diner at night, she acquired her New York State Cosmetology License and subsequently able to work as a beautician. In 1952, Mother began working at E.J. Meyer Memorial Hospital (presently Erie County Medical Center) as a unit clerk for the Psychiatric Nursing Department. After 25 years of service, Mother retired in 1977. When Mother moved to Buffalo, NY, she was eager to find a church home. She heard on the radio that the husband of a childhood friend, FD Washington, would be in revival at Holy Temple COGIC. Mother attended the revival and decided to join Holy Temple under the leadership of the late Bishop E.F. McClellan. 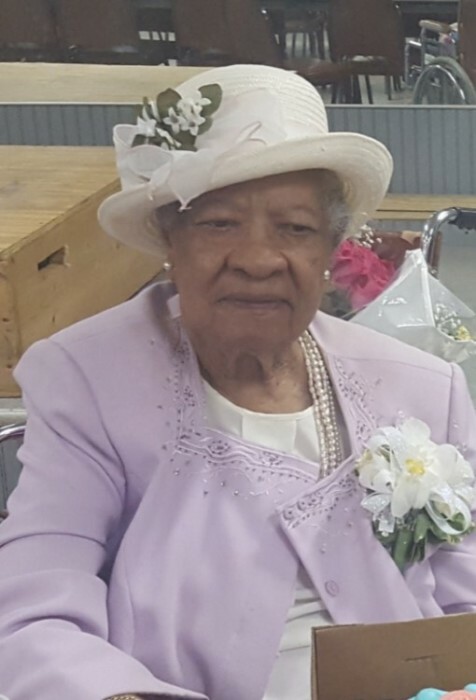 While a member of Holy Temple, she served as Sunday School teacher, YPWW President, Bible Band Secretary, Radio Announcer, Church Clerk and sang with the McClellan Gospel Chorus. On April 24, 1965, Mother entered into holy matrimony with Elder Marvin W. Robinson. In December 1972, the Lord led elder Robinson to birth Evening Star Church of God in Christ. Mother Robinson received her evangelist license under New York western Jurisdiction, Department of Woman Supervisor, Mother Elizabeth Walker. As a pastor's wife, Mother served her local church as the leader of Friday night prayer, Assistant Sunday School Superintendent, President of the Mother's Board, Church Clerk, and Organist. Within District Seven of the New York Western Second Ecclesiastical Jurisdiction, Mother also served as District Missionary, President for the District Pastor's, Elder's, and Minister's Wives Auxiliary, Sunday School Superintendent and teacher. As a Jurisdiction worker, Mother served with the Program Committee for the Women's Department, Women in White and the Examining Board to license missionaries. On March 15, 2019, the Lord called home his good and faithful servant. Mother is preceded in death by her parents, Willie and Vester Andrews; daughter-in-law, Kathy Smith; sons-in-law, Zebbie Sanford, Rudolph Bolyar, Horace Jones and Rudine Walters. Mother Bessie Robinson leaves to cherish her memory: husband, Superintendent Rev. Marvin W. Robinson; son, Burl L. Smith; grandsons, Brandon and Sheldon Smith. She also leaves to cherish her memories six loving stepchildren: Peggy Sanford, Juanita Walters, Christine Bolyar, Rev. Francine Jones, Gwen (Fred) Ingram, and Pastor Tony (Connie) Robinson; and a host of other dear family and friends.